I, of course, read all the books that a boy that age would like—The Rover Boys; Frank Merriwell at Yale; Horatio Alger. I discovered Edgar Rice Burroughs and read all the Tarzan books. I am amazed at how few people I meet today know that Burroughs also provided an introduction to science fiction with John Carter of Mars and the other books that he wrote about John Carter and his frequent trips to the strange kingdoms to be found on the planet Mars. Long before that, indeed, [Reagan] could remember the warring empyrean of his favorite boyhood novel, Edgar Rice Burroughs’s Princess of Mars. I keep a copy on my desk: just to flick through it is to encounter five-foot-thick polished glass domes over cities, heaven-filling salvos, impregnable walls of carborundum, forts, and “manufactories” that only one man with a key can enter. The book’s last chapter is particularly imaginative, dominated by the magnificent symbol of a civilization dying for lack of air. For obvious marketing reasons, I’d love to be able to draw a direct line between science fiction and the Reagan administration. Yet it’s also tempting to read a greater significance into these sorts of connections than they actually deserve. The story of science fiction’s role in the Strategic Defense Initiative has been told countless times, but usually by the writers themselves, and it isn’t clear what impact it truly had. (The definitive book on the subject, Way Out There in the Blue by Frances FitzGerald, doesn’t mention any authors at all by name, and it refers only once, in passing, to a group of advisors that included “a science fiction writer.” And I suspect that the most accurate description of their involvement appears in a speech delivered by Greg Bear: “Science fiction writers helped the rocket scientists elucidate their vision and clarified it.”) Reagan’s interest in science fiction seems less like a fundamental part of his personality than like a single aspect of a vision that was shaped profoundly by the popular culture of his young adulthood. The fact that Reagan, Heinlein, and Asimov devoured many of the same books only tells me that this was what a lot of kids were reading in the twenties and thirties—although perhaps only the exceptionally imaginative would try to live their lives as an extension of those stories. If these influences were genuinely meaningful, we should also be talking about the Rover Boys, a series “for young Americans” about three brothers at boarding school that has now been almost entirely forgotten. And if we’re more inclined to emphasize the science fiction side for Reagan, it’s because this is the only genre that dares to make such grandiose claims for itself. There is a part of a line from the movie Torn Curtain about making missiles “obsolete.” What many inferred from the phrase was that Reagan believed what he had once seen in a science fiction movie. But to look at the explanation as a whole is to see that he was following a train of thought—or simply a trail of applause lines—from one reassuring speech to another and then appropriating a dramatic phrase, whose origin he may or may not have remembered, for his peroration. Yet the exceptionally imaginative shaped the culture. There’s more to it than that. I interviewed Gene Kranz, NASA Flight Director during the Gemini and Apollo programs, around 2000. Though I didn’t elicit it, at one point Kranz became quite voluble about the influences that shaped him during his youth, stressing not only the importance of the SF pulps to his world-view but also that of the ‘Air Ace’-type pulps and popular aviation magazines. In other words, SF was part of a popular cultural continuum in which the Wright Brothers’ first powered flights were only a couple of decades in the past. By the mid-1940s, the German V2 rockets and the atomic bomb — whose real-world physics were initially conceived of by Leo Szilard in 1933, following his reading in 1932 of H.G. Wells’s fictional account of atomic bombs in THE WORLD SET FREE (1914) — were accomplished facts. By the 1950s, you get figures like John von Neumann talking about ‘this Buck Rogers universe we are entering’ (see Richard Rhodes’s DARK SUN) and grim realists like USAF SAC commander General Curtis LeMay demanding a nuclear-powered bomber that would stay airborne for 6-9 months at a time so he could maintain parity with the US Navy and Admiral Hyman Rickover’s nuclear submarines. As matters turned out, the 1950s were arguably the most Faustian decade in history and things would tail off after Apollo. But you can see why, based on the exponential curve of development from the Wright Bros to Sputnik in a half-century, a lot of intelligent people expected Kubrick and Clarke’s 2001, not bin Laden’s. 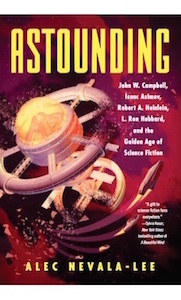 @Mark Pontin: Oh, I absolutely agree that their early childhood reading of science fiction was important to Asimov, Heinlein, many scientists, and engineers at NASA. I’m just not sure that it makes sense to single it out as a meaningful influence on Reagan. You probably watch more TV than he does Alec. He likely has someone watch TV on his behalf…point taken all the same.